A part of Uttar Pradesh has been separated and formed into a new state Uttarkhand on November 9th 2000. The details given here are before the separation. Uttar Pradesh shares an international border with Nepal to the north along with the Indian state of Uttarakhand, Himachal Pradesh to the north-west, Haryana, Delhi and Rajasthan on the west, Madhya Pradesh on the south, Chhattisgarh and Jharkhand on the south east and Bihar on the east. Situated between 23o 52'N and 31o 28 N latitudes and 77o 3' and 84o 39'E longitudes, this is the fourth largest state in the country. The Himalayan region comprises the districts of Uttarkashi, Chamoli, Pithoragarh, Tehri-Garhwal, Garhwaland Almora and Nainital tehsil of Nainital district and Chakrata and a part of Dehra Dun tehsil of Dehra Dun district. High mountains formed of sedimentary rocks broken by valleys and deep gorges, characterize the terrain. The perpetual snows in the higher reaches are the source of perennial rivers and rivulets which criss-cross the terrain and ultimately find their two rivers together with their tributaries form a big river system which waters the entire Gangetic plain. The prominent peaks in the hill region include Banarpunch, Mount Kamety, Trishul, Dunagiri, Nanda Devi, Badrinath and Kedaranath. The hill areas are sparsely populated. Due to the excessively nature of the terrain, soil is subject to heavy erosion. Cultivation is done under intensive soil. Irrigation facilities are deficient and only a small fraction of the total area is under artificial irrigation. The valley area have fertile and rich soil. There is an intensive cultivation on terraced hill slopes. The higher altitudes are suitable for sub-tropical and temperate fruit culture. The Siwalik range which forms the southern foothills of the Himalayas, slopes down in to a boulder bed called 'bhadhar'. The transitional belt running along the entire length of the state is called the terai and bhabhar area. It has rich forests, cutting across it are innumerable streams which swell into raging torrents during the monsoon. The bhabhar tract gives place to the terai area which is covered with tall elephant grass and thick forests interspersed with marshes and swamps. The sluggish rivers of the bhabhar deepen in this area, their course running through a tangled mass of thick under growth. 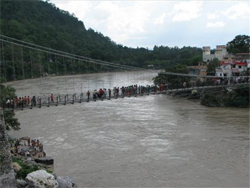 The terai runs parallel to the bhabhar in a thin strip. The main crops are wheat, rice, and sugar cane. Jute also is grown. Tea is grown in the sub mountain area of the Dehra Dun. The most important area for the economy of the state is the Gangetic plain which stretches across the entire length of the state from east to west. The entire alluvial plain can be divide into three sub-regions. The first in the eastern tract consisting of 14 districts which are subject to periodical floods and droughts and have been classified as scarcity areas. These districts have the highest density of population which gives the lowest per capita land. The other two regions, the central and the western are comparatively better with a well-developed irrigation system. They suffer from water logging and large-scale user tracts. The Gangetic plain is watered by the Jamuna, the Ganga and its major tributaries, the Ramganga, the Gomati, the Ghaghra and Gandak. The whole plain is alluvial and very fertile. The chief crops cultivated here are rice, wheat, millets, gram, barley Sugar cane is the chief cash crop of the region. 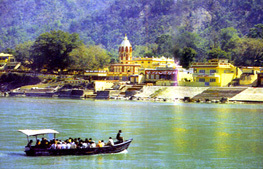 The Southern fringe of the Gangetic is demarcated by the Vindhya hills and plateau. It comprises the four districts of Jhansi, Jalaun, Banda, and Hamirpur in Bundelkhand division, Meja and Karchhana tehsils of Allahabad district, the whole of Mirzapur district south of Ganga and Chakia tehsil of Varanasi district. The ground is strong with low hills. The Betwa and Ken rivers join the Jamuna from the south -west in this region. It has four distinct kinds of soil, two of which are agriculturally difficult to manage. They are black cotton soil. Rainfall is scanty and erratic and water -resources are scare. Dry farming is practical on a large scale.